The seven days of Passover have just ended in the past half-hour with nightfall here in Jerusalem (it's Monday night). Catching up with the news of the past day when we're disconnected from the electronic news media is always accompanied by a degree of apprehension, and tonight it's borne out by the realities of this morning's events about which we are just getting familiar now. Ten rockets fired from the Gaza Strip exploded in southern Israel Monday, prompting Israeli retaliatory strikes on the Hamas-controlled territory. Red alert sirens sounded Monday morning in Sderot and the Sha’ar Hanegev region of southern Israel, adjacent to the Palestinian enclave. Seven rockets fell in open areas in the Sha’ar Hanegev region and outside the city of Sderot, causing no injuries or damage. One rocket exploded in Sderot, causing damage to a road and several shops. 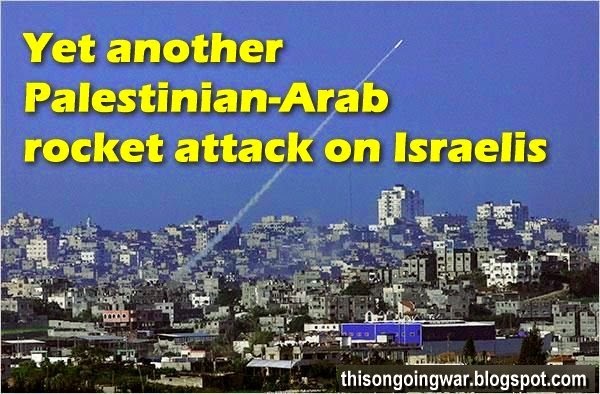 Another rocket struck the Eshkol region of southern Israel, but regional officials said the warning sirens did not go off. According to Army Radio, the Iron Dome missile defense system intercepted an inbound rocket as well. A police spokesman said police bomb disposal experts were searching for the remains of the projectiles. We will update as we learn more.